“However, the risk of paying too high a price for good-quality stocks – while a real one – is not the chief hazard confronting the average buyer of securities. Observation over many years has taught us that the chief losses to investors come from the purchase of low-quality securities at times of favorable business conditions. The purchasers view the current good earnings as equivalent to ‘earning power’ and assume that prosperity is synonymous with safety. It is in those years that bonds and preferred stocks of inferior grade can be sold to the public at a price around par, because they carry a little higher income return or a deceptively attractive conversion privilege. It is then, also, that common stocks of obscure companies can be floated at prices far above the tangible investment, on the strength of two or three years of excellent growth. For investors, the Year 2018 started with much promise. Stocks soared in January, continuing their run from 2016 and 2017. However, as one might say, A Funny Thing Happened on the Way To The Forum as investors grew nostalgic for the markets of yesteryear. Unfortunately for investors, they actually returned, along with all their volatility. From its starting point of 2674 at the beginning of the year, Mr. Market soared to 2873 in January, only to plunge in February, sending investors on a rollercoaster ride for the rest of the year. Oh, the wonders of the past. And it has been quite a ride too. From Mr. Market’s low of 2582 in April, it soared to 2931in September. Only to plunge again in October, ending the month at 2712. If an investor went on a 10 month vacation, he or she would have thought it a ho-hum year as the market rose less than 2% since the beginning of the year with a projected total return for the year, including dividends, of just 4%. Below average, but after several good years, not bad. However, hidden in the “Ho-Hum Year” and the effective sideways movement of the market stands a looming question. Does 2018 represent the future? Does 2018 represent the type of returns and inherent volatility that I can expect over the next 5 – 10 years in the public equity markets? And, if the answer is yes, do other asset classes, such as fixed income, real estate, … represent alternative opportunities with competitive returns and less volatility over the next decade? While short term predictions of equity market movements sit in the trash can of history, as they have been proven wrong over and over again, longer term predictions, based on valuations, economic growth, and interest rates, demonstrate high levels of validity. The Federal Reserve’s goal was to slow the economy, which it did. Economic growth went from ~8% in 1965 to run rate of less than 4% by the end of 1966. When the dust cleared, markets stood 21% lower in response to the Fed. Profits continued to grow at a reasonable clip, but the rise in interest rates forced stock valuations lower. As the Fed then eased, markets rose once more, but not much above their January 1966 high before the Fed entered another tightening campaign, this time plunging the economy into the 1969 – 1970 Recession. Of course, the following 10 years proved disastrous for the Equity Markets, despite Real GDP growing almost 40% from $4.9 trillion in Q1 1970 to over $6.8 trillion in Q4 1979 or at a 3.3% compound rate. While reasonable economic growth occurred, despite the 1974 – 1975 Recession and the two massive increases in oil prices, the rise in inflation coupled with the significant increase in interest rates compressed stock valuations, creating negative real returns for equity holders. Chart courtesy of Robert Shiller at Yale available at http://www.econ.yale.edu/~shiller/data.htm. 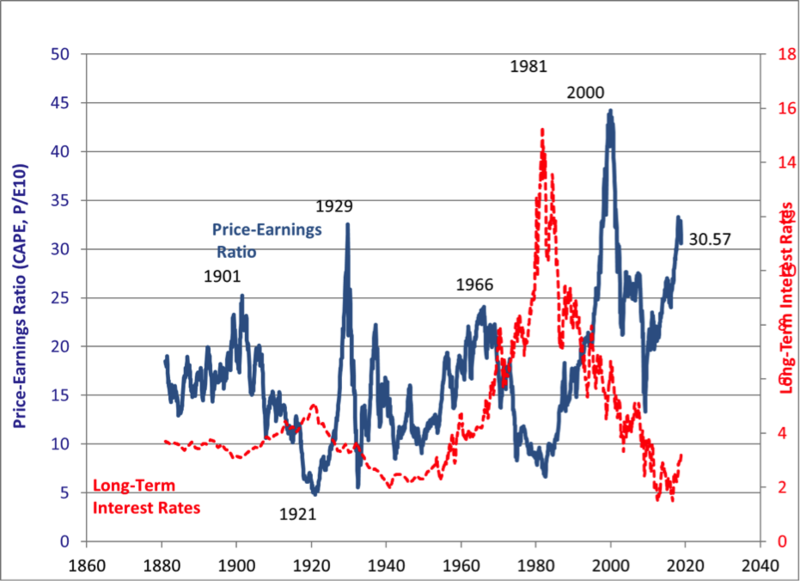 As the above chart shows, valuations stand at levels similar to 1929 and were only exceeded in 2000 during the Tech Bubble. Ten Year Forward Returns were nothing to write home about from those starting points. Tobin’s Q presents a similar picture. 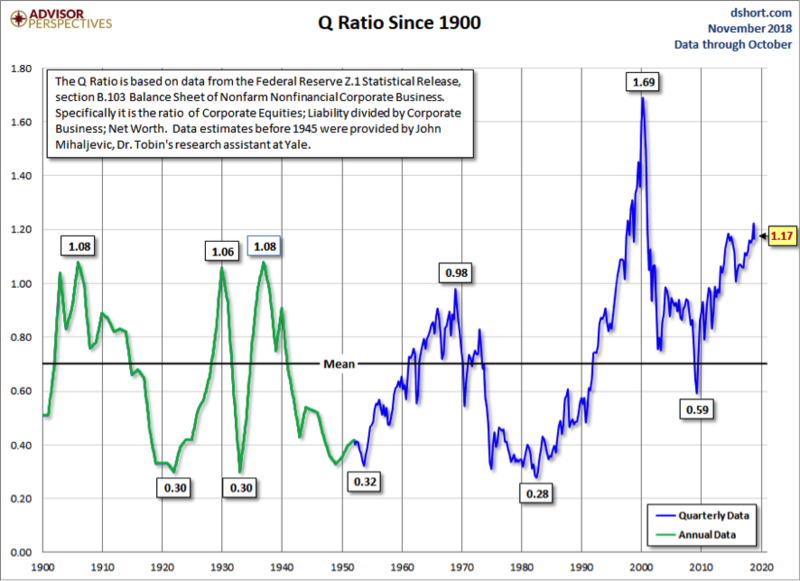 Stocks relative valuations stand at levels slightly above those seen in 1907, 1929, and 1968 but below the peak in 2000.